(HIB) – While hosting family and friends at home can be a fun, bonding experience, the extra traffic can create less than comfortable quarters. 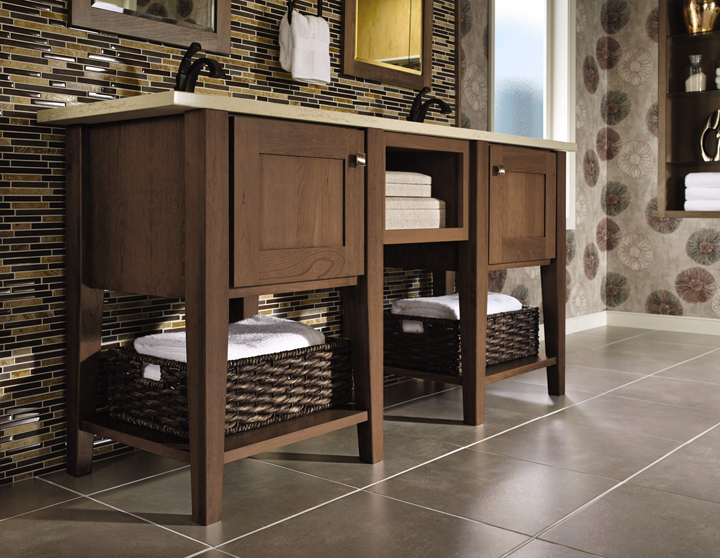 Give your overnight guests a bathroom retreat specially designed to meet their needs away from home. With some slick, yet simple, lavatory upgrades, your only worry will be ensuring your guests remember to leave. 1. Revive your bath with a fresh coat of paint. Guest baths are typically smaller than a master suite, so open up the space with light shades of pastel and soft neutral tones. Check out the color guides in your local Home Depot for some fresh, inspirational selections. 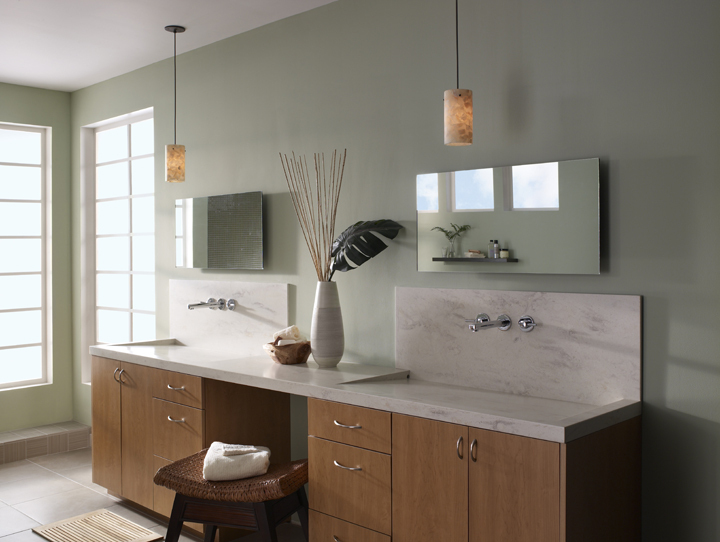 The Behr 2015 Color Trends report can provide fresh ideas and palette inspiration. 2. 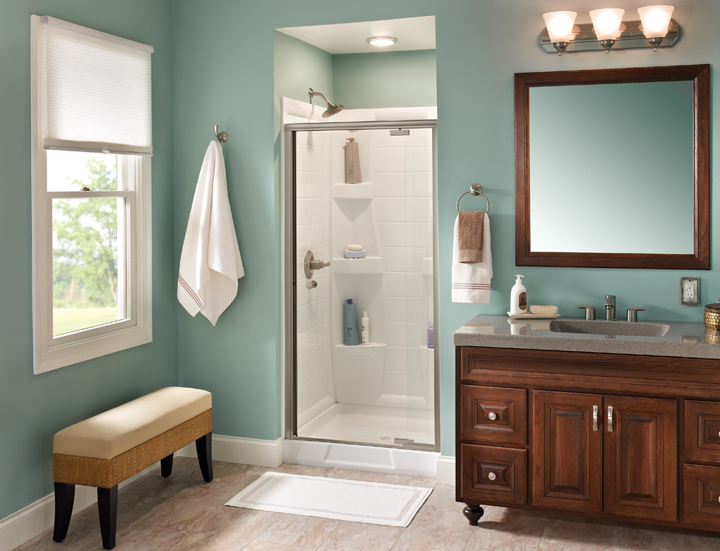 Replacing an outdated shower door or curtain is an easy way to open up a small or windowless guest bathroom. With more than 140 design possibilities, Delta Shower Doors provide homeowners with an easy three-step design selection process online – simply select a glass pattern and size, frame and hardware style to create the right door for your refreshed space. 3. Provide guests with a selection of essential necessities. Your guests may have left all the comforts of home behind with their jam-packed suitcases, so offer them a spa-like experience with bath salts, lotions and aromatic candles within easy reach. 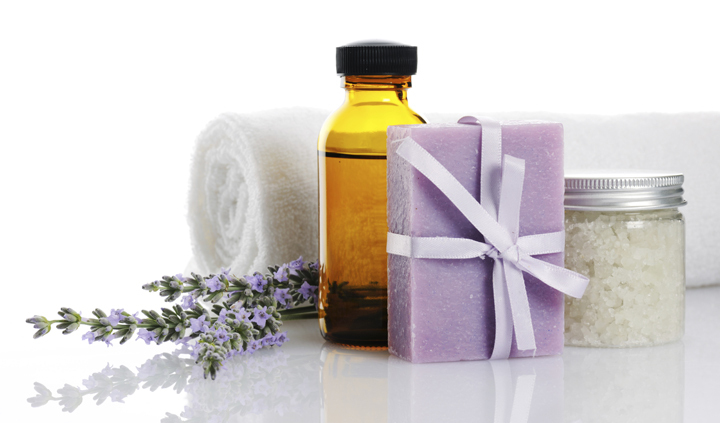 To ensure your guests feel special, provide personal portions of soap, shampoo and conditioner just for their stay. Essential oils for the tub add a hint of luxury and can be enjoyed long after your visitors depart. 4. Upgrade the old for improved functionality. 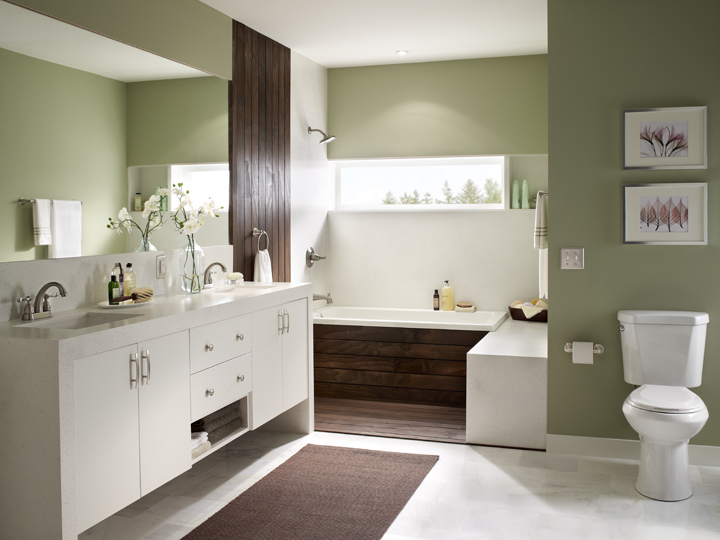 A top bathroom concern is the fear of toilet overflow, especially in someone else’s home. 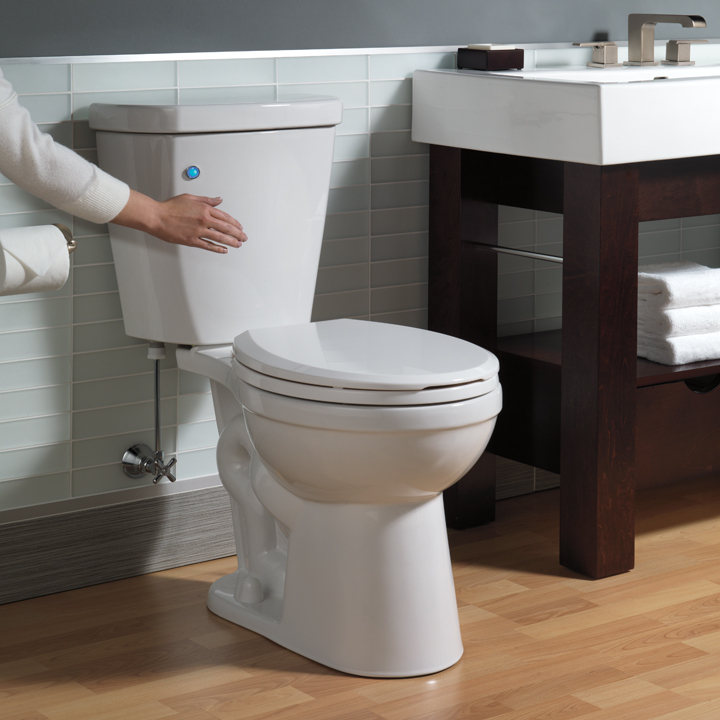 Replace your outdated toilet with one with Delta FlushIQ Technology, which offers overflow prevention and leak detection, and boasts a touch-free sensor, eliminating the need to touch the handle. 5. Keep guest essentials organized. When hosting overnight guests, it’s important to stock up on extra towels, facial tissue or a spare hairdryer for their use. However, bathroom clutter can build up quickly. Consider personalized cabinetry for an organized upgrade once your guests return home. Explore this style quiz to find cabinetry that best fits your design preference. 6. Give guests a luxury shower experience. The guest bath might not see as much day-to-day traffic as other rooms in the house and leaky showerheads may not be as apparent. Avoid surprising your guests with a showerhead that doesn’t flow or function well. Replacing your showerhead is a quick and easy project. Simply grab an adjustable wrench and a bit of plumber’s tape to ensure there are no leaks and you’ll have a bathroom upgrade in less than five minutes. 7. Give the bath a finishing touch. Enhance existing storage cabinets and drawers with a fresh coat of paint or stain. Then, pull it all together with decorative hardware like knobs, pulls and towel hooks in any finish and style to put the final touch on your bathroom upgrade.